This is the second part of the tutorial, If you missed the first part of this tutorial, you can find it here. The main goal of using an End Script,because it has access to the DOM of the web page. This is the only place where we can put ourJS code with the ability to addthe event listener on the visited page elements. recursively util a link tag is found. existing element of the document. As you can see in the source code above in line 28, the advantage of using JQuery.on() that the attached click Event handler clickHandler() will work for both current and FUTURE elements (like a new element created by a script). The purpose is that when the user clicks on an element clickHandler() will be executed and the clicked element (the object) itself will be passed as parameter to this function. Inside this function we check the element type. If it is a link or an element wrapped by a link tag <a> we dispatch a message containing link information to the Global Page. As show above in the Global Page source code, the event listener in line 13 is executed once Safari launches or when enabling the extension, it tells handleMessage() to catch incoming messages from external scripts. 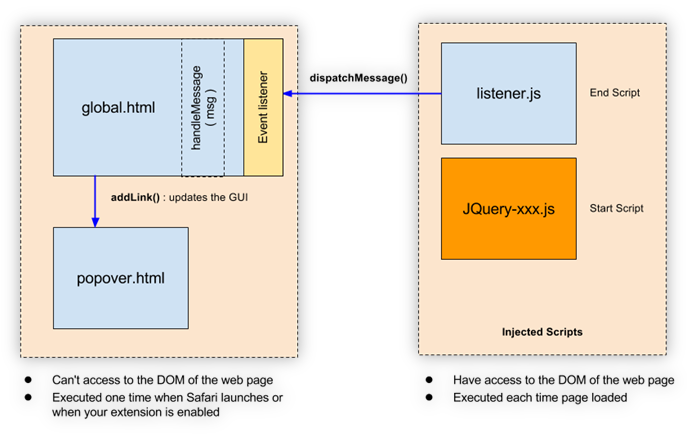 When dispatchMessage() is executed inside “listener.js”, the message will be immediately cached by handleMessage() from the global page. Inside this function the message type is checked then addLink() from “popover.html” is called with passing the link URL as parameter. addLink() will update the container from the Popover by adding a new row. You should know that you can’t update Popover interface from the global page because it hasn’t got access to Popover DOM. var datetime = ('0' +currentdate.getDate()).slice(-2) + "/"
+ ('0' +(currentdate.getMonth()+1)).slice(-2) + "/"
+ ('0' +currentdate.getHours()).slice(-2) + ":"
The picture below summarizes the above text. 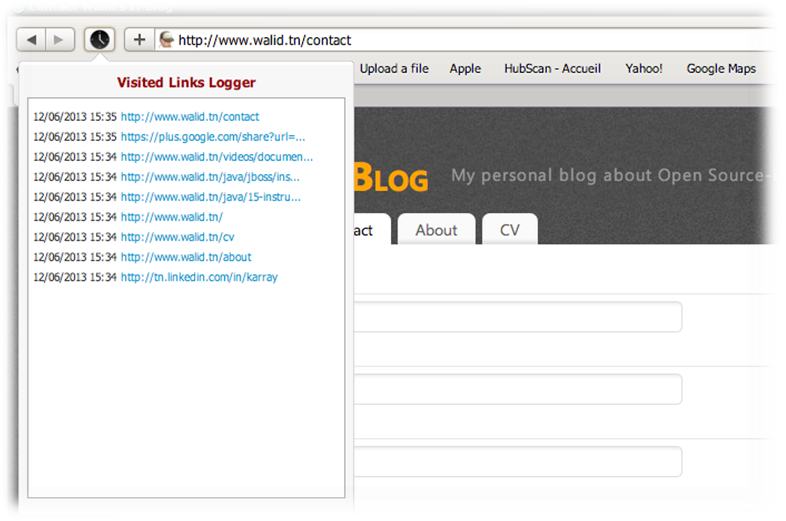 The development of Visited Links Logger Safari extension has come to the end and it’s now time to test it. Ready? So, go to the Extension Builder then click on Reload button which will update our extension by new the modifications we made. Now everything should be fine, try to visit a few web pages and click on the links inside, you will get a result like in the picture below. At this point we are still in the development stage and we haven’t made a finished extension yet, the extension is stored as a folder that contains some source files and an icon, for the moment it can’t be delivered to any end-users. All we need to do next is to generate a compact package. Once again the Extension Builder makes this task very easy to do by a single click on the Build Package button (see the picture below) then choose where you want to save your package. As a result, you should have a new package named: “VistedLinksLogger.safariextz”, it can be installed by opening the file or dragging it to Safari. You can also publish this extension in the Apple extension gallery. I hope this tutorial was very helpful. If you need more help, please don’t hesitate to contact me or leave a comment and I will try to reply ASAP. To end off, I would like to thank Paola Pereira for the English review. this? IE nonetheless is the marketplace chief and a big section of folks will leave out your excellent writing due to this problem. Ι like it when folks get together and share thoughts. Is it possible to use builtin safari functions like print_2_pdf? Dated, but still helpful. Thanks!